NO pressure, and no silly questions. That was the premise of a basic mechanics knowledge course delivered to local women yesterday. Gladstone's Coordinated Community Response to Domestic and Family Violence held the workshop in partnership with Gladstone Women's Health Centre. Alana Cross is going for her P plates soon and is restoring a 1995 model Land Rover with some help from her mechanic uncle. She said she picked up a few new tips at the workshop, including advice to never mix coolants (instead top up with water). Unlike Alana, many women don't learn about the mechanics of the vehicles they drive. 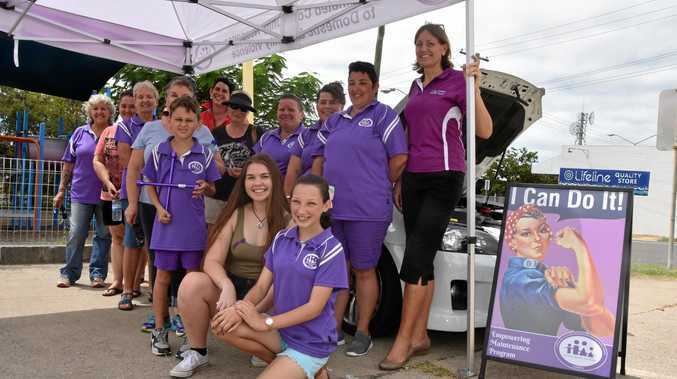 "Women drive vehicles and they should be able to, if they get into a situation, get themselves out of a situation," event organiser Karen Harris said. A female mechanic of about 35 years led the workshop, giving attendees hands-on advice. "If they get a flat tyre, (women can) get quite intimidated," MsHarris said. "Here they learn (mechanical skills) simply from a female."